The real start of my love for cooking happened when I was about twelve years old and I was given my first cookbook - Jamie Oliver's The Naked Chef. From here I was hooked! I loved his recipies and pretty soon my Jamie-O cookbook collection started to grow. Without Jamie I don't think I'd have the same passion as I do today. Here is one of my favourite Jamie Oliver recipes - I made it for my girlfriends one Christmas and they loved it. His recipes are so simple and so fresh - using great ingredients to create a simple but delicious meal! 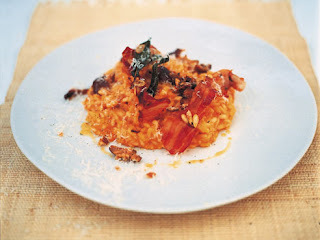 This risotto (Roast Squash, Sage, Chestnut and Pancetta Risotto) is so comforting and great in winter!